The St. Barnabas Episcopal Church sanctuary, designed in 1958 by Phillip Ives, was originally served by a Casavant organ. Initial talk of a new organ in 1988 led to a leap of faith for us, Director of Music, Michael Roush, and organ committee chair, Richard Schulze, to build our Opus 1 of 35 stops on 2 manuals and pedal. The contract was signed in 1989 which also marks the locating of our shop in Ooltewah, TN. 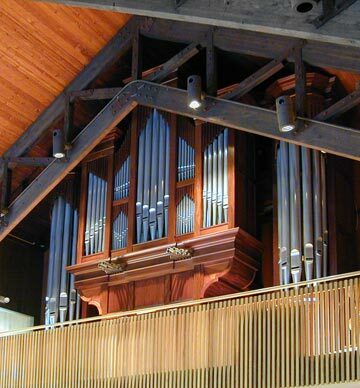 The desire for a full sized organ (with a 32 foot reed) in a small sanctuary was met with a complete two manual instrument rather than divided over 3 manuals. The simple, French polished mahogany case with side towers fits nicely in the balcony of the uncluttered and somewhat dark interior of the church.